Which way to head from this grand old town? Keswick presents problems for an indecisive walker. The town’s reputation as the hub of outdoors activity in the Lake District is well deserved. The giant peaks Skiddaw and Blencathra rise up to the north, provide a challenging day for anyone keen to scale the heights. To the southwest, the fells that circle the Newlands Valley form a classic horseshoe, while a stroll around Derwent Water will attract those looking for something more leisurely. This tempting array of possible routes spun around my head as the 555 bus ambled through the Lakes. Being more familiar with the southern fells – the nearest during student days at Lancaster University – all the options were appealing. I was still undecided upon arrival at Keswick, but the imminent breaking of a fierce looking black cloud dictated that erecting the tent as swiftly as possible took priority. The tent was positioned to avoid the rapidly expanding puddles in the Keswick campsite, but the aspect unintentionally signalled the way forward next morning. The doors opened to reveal Cat Bells glistening brightly in the morning sun. Decision made; I set off to Portinscale and the start of the Newlands Round. A bus service runs from Keswick to the foot of Cat Bells during summer months, but it would have been a shame to miss the early morning sights, sounds and smells of Overside Woods, with the few remaining bluebells struggling to compete with the wild garlic. Cat Bells attracts the full spectrum of Lakeland walkers. 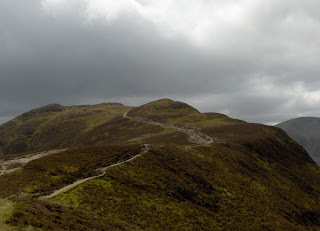 Maybe it’s the easy access from Keswick, the relatively short climb, or just the indisputably cute name. Early on this overcast Sunday morning (the early rays long since departed) the carefully constructed zigzag path was rapidly filling up. Seven teenagers, heads down, rucksacks full, trudging silently in single file – they could only be a Duke of Edinburgh group, and the weary expressions and mud-splattered kit suggested they were at least three days into their expedition. 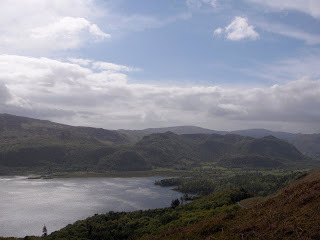 Near the summit, two athletic looking men nodded a brief greeting as they hurried past, clearly heading for bigger challenges than humble Cat Bells can provide. On Maiden Moor, I found myself having a late breakfast of Babybels and an apple next to a Dutchman heading for Buttermere. As we chatted, he told me this was his first visit to the Lake District and he was clearly enthralled. "We have nothing like this in Holland…just look at that view", he said, gesturing towards High Spy and Dale Head. By this time, the slate grey clouds were forming an angry mob over the summits, casting the landscape in a brooding, pallid light. 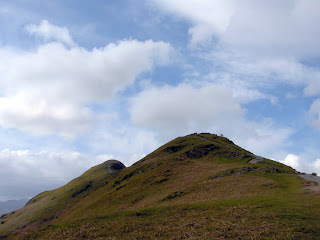 I had seen the fells look more attractive, but it seemed a little churlish to quash his moment. Grinning wildly, he headed off into the murk and drizzle. The light waves on Derwent Water were catching the few rays of sun that sneaked through, shimmering brightly in contrast to the gloom ahead. Tiring of the constant buzz of human chatter, an incessant line of hikers on all sides, I decided to drop down and return to Keswick via the lakeside. The map showed a clear path down between Maiden Moor and High Spy, so I took a bearing and veered off from the crowds heading onwards. It felt good to be alone, a sense of rebelling against the masses – similar to playing truant from school. The walking clichés all applied – choose your own adventure, get off the beaten track, go against the flow – the experience many walkers crave. This preoccupied elation almost proved disastrous. As I headed over the edge of Blea Crag, the valley scene attracted my attention, rather than the ground below. Instead of heading down Low White Rake, I found myself halfway down Nitting Haws, trapped on a narrow, exposed and slippery ledge. A bulging rucksack prevented an easy about-turn and scamper back up, and the free-spirited sensations of a few minutes ago quickly dispersed; solitude was now the last thing I wanted. It took several anxious minutes, a Chaucerian selection of curses, and scrambling moves that you won’t find in any training manuals to get to the safe ground near Cockley How. Looking back, the obvious scramble down the rake was clear about 10 meters to the right; its taunting simplicity a stark contrast to the precarious drop I had been scrabbling above.